Good stuff Gav and I have nine the same as you and have substituted Iceland in for Malta. The dodgy trading my only danger here. Enjoy tonight mate. In a new comment ill wright my views on the second half. Not sure Lithuania are quite as safe as people think Gav. It’s a decent enough opener but the juries may view it as a bit cheap and trashy and cheesy compared to the later duets as well as the likes of Sweden and Latvia. If Ireland can’t qualify with a classy ballad and singer like this and especially with juries voting, RTE can throw their hat at it. You would have thought too the presence of UK, Australia, Norway, Sweden, Switzerland, Malta, Latvia, Poland etc would be more than enough to get her over the finishing line. For the same reason, I think Montenegro are in huge trouble. Who of the western and northern nations are going to award generous points to a Balkan ballad sung by a middle aged bloke in a language they can’t understand? I’m not entirely convinced Cyprus are going to do a Tom Dice. He had a lot of appeal as a talented and good looking young singer / songwriter…..this entry is a little more at risk of wavering into cheesy boyband territory rather than a credible and contemporary effort. I do agree that Azerbaijan are at serious risk. It’s a horrible song, uncharismatic singer and the staging looks awful. On the second half, Like Gav I had Israel down as a no before the contest but watching it last night ( I was in the Stadthalle) I can see that there will be a decent score ( borderline though) in juries and tele votes so It should get Israel through in 7th-10th. Latvia I had down as a likely qualifier when the allocation draw was made ( be4 aminata was picked) because of a second half draw in a semi with lots of friendly votes but once Aminata was picked I had it as a lock to qualify and that has never changed, Im not a fan of the song but I can see its jury appeal and even the public might be into it so its sailing into the final and maybe even a finish on the left hand side of the score board is possible. Azerbaijan could be at risk of being the biggest shock NQ to date in eurovision because like you said Gav they are starting from 0 and with the way the EBU cracked down on the voting last year we saw how friendless they really are and In a semi with a song that to be fair oozed quality with a lot of friends voting still didn’t get through on the tele vote and needed a high jury finish to be saved and this song could be in trouble as there isn’t as many friends and its a bigger semi final and when you consider there distracting staging compared to other ballads with much simpler stagings it could harm there telelvote. But that said the song is stunning so based on song quality it should be top 5 and even with all the factors I’ve mentioned when you must only place top 10 in a semi where there are only 14 countries battling its hard to imagine them NOT qualifying, Iceland….There is no redeemable features what so ever about this entry and like is said about the juries doing there jobs well…if they are than this should be bottom 3 in the jury because the song isn’t there, the performance isn’t there, the vocal isn’t there…I don’t get how a jury can rank this top 10 and being right between 2 much better packages ( Azerbaijan’s distracting staging is like man in a box staging in comparison) and being followed by Sweden then I can’t really see how this will qualify and when you consider the scandi vote you’d surely imagine that vote is going to go to SWE or NOR. Sweden…not going to waste time basically : Qualifying top 3 ( 99 percent sure its winning the semi) and guaranteed top 5 on saturday night. Switzerland great performance but like Moldova in semi 1 I don’t think any performance can save this song, Melenie Rene is REALLY REALLY pretty so she could get some votes on that but not enough to qualify sadly ( for them) Cyprus, there is enough in the performance to just sneak into the final even though I think this is the worst entry in ESC for a long time and be4 the contest I honestly thought it was fighting with Portugal for last in the semi final but now based on reports I must go with my head and admit that its probably going to just about make it even though I don’t think it deserves to. Imo ORF probably agree thats its a boring nothing song and have deliberately put it and Switzerland here in the running order ro make Slovenia and Sweden stand out more. Slovenia I don’t like it and think its very overrated but when you consider the running order and that semis are very big for fan votes I do think it will make it quite comfortably but the staging will stop it doing huge things on saturday, the staging shouldn’t hurt them after all bad staging didn’t stop Belgium and Albania qualifying so they should be safe. Poland…..dire and is totally relying on sympathy and in semi 1 Finland didn’t get the sympathy vote so hopefully Poland don’t either and to be honest even juries are going to find this dull and it being the worst ballad in the semi I seriously don’t think even the pimp slot can save them. Gav….has there been a bit of a change in tone among the cognoscenti about Norway in the last 24 hours? The prevailing view to early this week was of a classy song dragged down by dull staging and lack of visuals, but from what you are saying, the simplicity and ever more focussed vocals seem to be improving their chances of a decent Top ten, possibly Top 5 finish?? What’s changed? Maybe they are just benefiting from the messy staging of others and less impressive vocals? It certainly stand out in the first 8/9 songs in tonight’s running order. Hi Mark. You make a good point. I think we all expected a new direction, but they have slowly finessed the staging over the last week into something that gets a great reaction from the arena audience. Like AramMP3’s song, it packs a powerful punch during the second half. I think top-5 might be a tad ambitious, but top-10 looks a good bet with a decent running order slot. I think this one is trickier, I feel quite sure about 7 Qs and 4 NQs but that leaves positions 8-13 up for grabs. It will probably be tight. My 10 Qs, “in no particular order”. You forgot Montengro in your review. Dave, it’s my opinion. You have your opinion. Leave it at that, shall we? Thats fair enough, I was just wondering. Possibly one of the toughest Semi-Finals to predict I’ve come across having followed ESC since 2009. YYYYIIIIHHHHAAAA! After the long wait it is finally here: the second semi-final of the Eurovision Song Contest Copenhagen 2014! I think this is a much stronger semi-final in contrast to the first semi-final on Tuesday. Was very hard for me to cut Slovenia from the list, but there you go. I’m fairly certain on 8/10, Israel and Iceland could be replaced by Czech Republic and Poland. How come whenever Malta gets 12 point it is always accused of dealing for it? It’s not as if Malta gets loads of 12 points each year? In my opinion the last 3 Maltese qualifications to the final were fully deserved. If you’ve come to that conclusion having read the last several year’s points charts, then fair enough. If you haven’t studied the points charts, then I suggest you do so. Nice read Martin and at last someone who is calling Ireland as a qualifier….I’m not sure where all the negativity has come from that is placing it in the bottom 3 in the qualification market, as if it’s hopes are slim to non-existent. I think Israel as a country doesn’t get much love from both jury members and televoters, no matter what they are sending, and therefore they can be the surprise NQ. Does anyone see good bets in this H2H list? 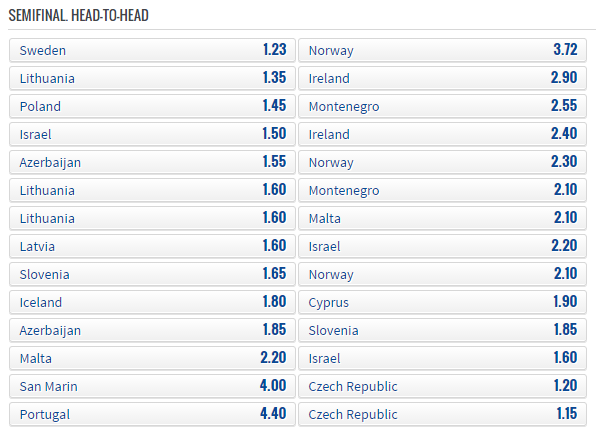 ISRAEL vs Ireland, NORWAY vs Azer, NORWAY vs Slovenia, CYPRUS vs Iceland. Predictions for easiest semi-final ever. I wish. Wouldn’t be a bit surprised if I only got 5. It’s that hard.